Showers with little or no threshold present at the entrance are trending now. Not only do they look modern and sleek, but they are also functionally versatile, providing safer and easier access by persons of all ages and abilities. What is a Prefabricated Shower Stall? A prefabricated shower stall, also referred to as a “Prefab Shower” for short, is a shower stall and/or shower components that are constructed off-site in a factory, as opposed to having a custom-built shower constructed entirely from scratch on site. 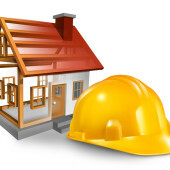 Less Mess: Much of the work is performed off-site resulting in less construction mess in your home. Reduced Time to Install: All the installer needs to do is remove the old tub, assemble and install it, as opposed to constructing each component of the shower from scratch. Easier to Clean: Prefab showers typically lack the tile grout lines found on many custom-built shower walls that are prone to develop mold. Less Water Leakage: If installed correctly, prefab showers usually have less incidents of water leaks, than custom built showers. Prefab showers can be ordered as one seamless shower unit or in multiple pieces that get assembled onsite. We have identified some of the advantages and disadvantages of each type below. Pro: Faster to install because it is already fully assembled. Pro: Easy to clean because there are very fewer joints where mold and dirt will get caught. Pro: If installed correctly, one-piece units are less prone to water leakage problems. Con: The drawback of a one-piece prefab shower is that it is a large, heavy, unwieldy unit which often won’t fit up the staircases or through the doorways and hallways of the home. A one-piece unit is usually easier to add when constructing a new home and it is installed before all the walls and doorways are completed. Pro: It comes in several pieces, so it is much easier to transport into the bathroom, typically making it a better consideration when remodeling an existing bathroom. Con: More joints than a one-piece unit, which means there is more potential for water leaks. Most prefab shower stalls are square or rectangular in shape. Some round stalls and neo-angular shower stalls exist as well. We have highlighted some the main benefits and drawbacks of each of these shower shape below. Square or Rectangular Shower Stall: Space permitting, square and rectangular shaped shower stalls are the best consideration for accessibility needs. Reason being, they tend to work best with adaptive equipment, such as grab bars, bath seats, benches, and rolling shower chairs. 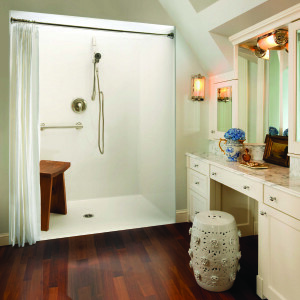 Neo-Angle Shower Stall: A corner-style unit, with a rounded or neo-angled front wall, may be a good consideration if you have a small bathroom and need to maximize the available floor space inside the bathroom to make it easier to move around inside the room using a walker or wheelchair. The drawback is that the interior of the shower stall is smaller, which can make it more more difficult to find shower equipment to fit inside. Round Shower Stall: Small, round shower stalls typically don’t work well for accessibility needs. It is harder to install grab bars on the rounded walls and many of the shower seats do not fit well inside. Ideal Threshold Height = Zero! Architecture permitting, a curbless, zero threshold shower or a shower with a rounded threshold that is ½ inch high or less at the entrance is ideal. Why? Even a simple, seemingly harmless threshold of one or two inches can prevent entrance by a walker or wheelchair user. Consequently, this means the home’s occupants will be more likely need to ask others for assistance with bathing in the later years of life. Curbless showers, on the other hand, inherently and readily work well for everyone! A young healthy person can use it. A person using a walker can easily walk into it. A person using a wheelchair, can roll right in and out without needing assistance from anyone else. Persons who needs assistance from a family member can easily be assisted in and out on a rolling shower chair. It can even make washing pets easier too. What if your home has concrete slab floors or another architectural design feature that would make it more difficult (or impossible) to recess the shower stall into the floor in order to create a flush, threshold-less entrance? If installing a threshold at your shower’s entrance can’t be avoided, try to select a prefab shower model with the lowest threshold possible that can be used in conjunction with a shower curtain (versus glass shower doors). The section below provides reasons why a shower with a curtain is normally a better option. Prefab Shower: Curtain or Door? The question about whether a shower door or curtain is better commonly comes up when designing an accessible shower. The answer: Shower curtains are usually preferable to shower doors. 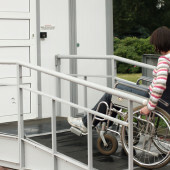 While a door will usually hold the water in better, it creates one more obstacle for a person using a wheeled mobility device to contend with. A person using a walker or wheelchair must approach the door, grasp the handle, then try to move awkwardly backwards with their mobility device out of the way of the door swing while also pulling the door open, which is not easy for most people to do! Furthermore, most showers with glass walls and/or shower doors are designed in such a way that a user can’t directly access a shower seat that’s located inside. If a small threshold is present at the entrance, users will only have one option to enter the shower: they will be forced to step over the threshold to enter. Stepping in and out over a threshold can be difficult or impossible to do for someone with a broken leg or for someone who is weak due to a stroke, Parkinson’s Disease, Multiple Sclerosis or just general age-related weakness. In contrast, a shower curtain can usually be pushed back out of the way to expose one side of the shower seat. This provides a user with the option to sit down on the side of the seat first prior to entering the shower stall. Then from a safe seated position, each leg can be lifted one at a time over the threshold. It also allows a wheelchair user to park beside the bench and slide sideways from their wheelchair seat onto the bench seat. Last, but not least, shower curtains are safer than glass shower doors. Why? Glass shower doors have a documented history of spontaneously shattering at times, which can cause an injury if someone is present in the room. Trench Drain: Install a trench drain along the edge of the shower and/or add a collapsible rubber water dam along the outer edge of the shower stall. Weighted Curtain: Select a weighted shower curtain or alternatively a shower curtain made out of a heavier material. Long Curtain: Choose the longest curtain possible that ‘almost’ touches the floor, but does not drag on the floor, because mildew will be more likely to build in the folds. Slope the Floor: Slope the floor slightly towards the drain. Install Water Stoppers: Water stoppers come in a variety of forms, which include: collapsible rubber thresholds, clips to hold the shower curtain closed, or small plastic triangular pieces that get installed on either side of the shower opening to prevent the water from escaping at the corners. Direction of Door Swing: It is important for a hinged-style shower door to swing outwards. Why? If a person falls inside a shower stall with an inward opening door their body can block the door from being opened, making it difficult for family or emergency personnel to help a person get out. Sliding Doors: The raised track most sliding doors rest in creates a barrier, making it more difficult (or impossible) for a walker or wheelchair user to enter and exit the shower independently. If you intend to install a curbless shower with sliding shower doors, frameless shower doors are a good consideration. This type eliminates the need to install a raised track on the floor. Make sure to also take into consideration the height and weight of the doors selected. The heavier the doors are, the harder the door will be to open and close. Prefabricated shower stalls may come equipped with a molded seat as part of the shower unit, providing a sturdy, stable seat to transition on and off of. Drawbacks of a built-in molded seat are that you cannot adjust the seat height to suit different shower users and you cannot remove it if you want or need to use a wheeled shower chair in the future. Shower stalls with built-in molded seats are available with the seat located on the left or on the right side of the stall. If your plumbing permits, we recommend to select a model that has the seat located on the side of your shower that will allow you to directly approach the seat (i.e. the side that is not blocked by the toilet or a vanity). A shower stall with a wall-mounted shower seat is another alternative. Prefab shower stall models can be purchased pre-equipped with a wall mounted seat. Or, it is also possible to purchase only the shower stall and install a wall-mounted shower seat of your choice. Wall-mounted shower seats come in a variety of types. There are models that hang fully suspended from the wall (no legs) and models that have two or more legs that extend down to the floor for added support. The models with legs provide an added degree of stability and are less likely to work their way loose over the years. Once installed, some wall mounted seats are designed to be rigidly fixed in place, while others have a hinge, allowing them to be flipped up out of the way when not in use. The type with a hinge allows for the greatest degree of flexibility because it can be flipped up out of the way if there is a time when someone living in the household needs assistance into and out of the shower using a wheeled shower chair. 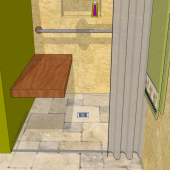 Lastly, you have the option to choose a shower stall unit that just includes a shower floor and walls, but no seat. Then you can purchase a portable-style shower stool, chair, or bench to place inside. 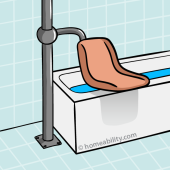 The drawback of using a portable-style shower seat is that it is not attached to anything, so it may tip or wiggle a bit when you sit down and stand up. The benefit is that a portalbe seat can be moved out of the way if someone in the home needs to be transported in and out of the shower using a wheeled shower chair. If you do opt to use a portable shower seat, the larger the seat you choose the more stable it will be. You can also consider installing a grab bar on the wall for added support when sitting down and standing up. Prefabricated shower stalls can be found made from acrylic, fiberglass, solid-surface materials, tempered glass, or a combination of these materials. The majority of the models that are available will have a fiberglass frame with an acrylic or polyester gelcoat. Below we have highlighted some of the pros and cons for each type of shower material. Tempered glass is designed such that if it shatters, it will fracture into many tiny pieces, instead of large, jagged glass shards, like a regular pane of glass. Pro: Allows more light to enter the stall. They do have potential to shatter, which could cause an injury. If some, or all of the walls are made from glass it can make it difficult (or impossible) to install soap dishes, storage shelves, grab bars and wall-mounted bath seats on the walls inside the shower. Fiberglass is a type of plastic that is reinforced with glass fibers. Fiberglass tubs will usually have a fiberglass frame and a strong, shiny gel top coat made from fiberglass reinforced polyester. Usually the least expensive type of shower unit, making it a good consideration for persons who are budget-conscious. Lightweight, which makes the unit easier for installers to transport and assemble. The finish is typically fairly easy to repair if damage such as scratches or chips occur. Fiberglass shower stalls will typically wear out faster than acrylic or solid-surface materials. Color is not present through the entire thickness of the material, so scratches or chipped areas may have a different color than the surrounding area. More porous and prone to staining and color fading than acrylic or solid-surface materials. More prone to scratching, cracking and chipping than acrylic or solid-surface materials. Acrylic is a type of plastic with a shiny glass-like finish. It is comprised of synthetic resins and textile fibers made from one or more derivatives of acrylic acid. Typically stronger, more durable, and tends to have a longer lifespan than fiberglass showers. Less porous that fiberglass, which reduces the chance that stains, dirt, or soap scum will penetrate the surface. Less prone to scratches and chips. Color is present throughout the entire thickness of the material, making scratches and chips less visible. Wider selection of color options. More expensive than fiberglass showers. More difficult to repair scratches or chips, if they do occur. These are composite materials that are either cast or compression molded. They are made by mixing marble dust, polyester and acrylic resin with powdered bauxite filler and pigments. Examples of solid-surface materials include Vikrell, Swanstone Veritek, and Corian, among others. Structurally more rigid, durable, non-porous, low maintenance, easy to clean, mold and mildew resistant, chip and crack resistant. If scratches or chips do occur they are usually easy to repair or refinish. Color is present through the entire thickness of the material, meaning any scratches that may occur will be less visible. Can mimic the appearance of wood grains and natural stone (i.e. cultured marble, cultured onyx, cultured granite all have the look of natural stone). They are thicker and heavier materials, often making it necessary to have a second person to carry and install the panels. Requires specialty tools to install. 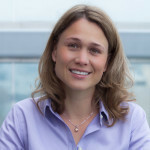 Lead time between product order and product arrival can be 4-6 weeks. Prefabricated showers can be ordered as shower kits, each of which can come with different parts. Some prefabricated shower model kits only come with the walls and a shower pan. Other models automatically include or have the option to include, slip-resistant flooring, a built-in seat, storage shelves, grab bars, handheld showerhead, shower doors and/or a trench drain located at the front opening of the shower pan to help retain the water. Select a kit that has prefabricated wall panels and install your own floor material. Select a prefabricated shower pan and install your own custom-built tile walls. Choose a basic model that includes a shower pan and wall panels. Then, select and purchase whatever shower seat, grab bars, or showerhead components you want. Note: Make sure to install wood blocking in the walls before installing the wall panels! This allows you the option to install the seat and grab bars anywhere you need them. The type and location of the shower controls is an important consideration. Ideally, the shower controls should be located adjacent to the seat, making it possible for a bather to easily control the water pressure and temperature from a seated position. If the layout won’t allow for this, then install a handheld showerhead with an on/off switch located on the showerhead itself. Single, lever-style shower controls are easiest for most users to operate. In a small, transfer-style shower (36”x36”) the controls can be located on the wall opposite the seat. Ideally, they should be installed between the centerline of the wall and the shower opening so it is possible to reach in, turn the water on, and adjust the temperature, prior to getting in. Location of the Drain is an Important Detail! Make sure to select a shower stall model with a drain that is located in the same location as your existing tub or shower’s drain, so the plumbing will line up correctly. Drains can be located on the left, right, or center of a prefab shower stall. Make Sure to Include Wood Blocking! Prior to installing a prefab shower stall, make sure to include wood blocking in the walls in the areas where a shower seat and grab bars will be installed. Prefab shower models will sometimes include a layer of wood on the back side, but many do not. If the shower model you have selected does not have wood-blocked walls, ask your contractor to install wood blocking inside your bathroom walls, prior to installing the shower stall. This will allow you to install grab bars, shower seats and other items anywhere you want or need to in the future. The cost to purchase and install a prefabricated shower stall “with a small threshold present at the entryway” usually ranges from $1,000 to $5,000. The cost will vary based on the amount of work the contractor must do to remove the existing tub or shower, the size of the stall, the material the new shower stall is made out of, the type and number of features the shower stall includes, and your geographic area. Installation of a “curbless shower” will cost more because architectural adjustments normally need to be made to lower the shower floor, as necessary to make the interior shower floor flush with the exterior bathroom floor. The price for installing a curbless shower varies widely based on size of the bathroom, price of the prefab shower unit selected, your home’s architecture, and the geographic area where you live. In some cases, a curbless shower can be installed for as little as $10,000. Consult with a local contractor to get a more accurate estimate. Installing a prefabricated shower unit can be a great way to quickly transform an inaccessible bathing space into an accessible one. When selecting a prefabricated shower unit, keep in mind that any amenities that may be included with it, such as the seat, soap dish, storage shelves, controls and grab bars will be permanently fixed in place, so make sure they fit your functional needs, prior to ordering. If you will be replacing your shower only (not remodeling your entire bathroom), then installing a prefabricated shower is typically cheaper, requires less on-site preparation time for installation than custom-built showers, and can oftentimes be installed in as little as a day, rather than the weeks it normally requires to install a custom-built shower. However, if you will be fully remodeling the bathroom and in doing so the bathroom will be gutted to the wall studs, then it may be equivalent in cost, or possibly even cheaper, to install a custom-built shower. 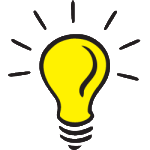 Discuss both options with your contractor to determine which solution is right for you. A shower with no threshold at all, also known as a curbless shower, makes great functional design sense for everyone! Curbless showers are effectively an investment in future independence because they are accessible by all users — regardless of age or ability level. If your finances or the architecture of your home won’t allow you to install a curb-less shower, the next best option is to install a shower stall with the smallest threshold possible and then to install a bench-style shower seat that extends to the shower threshold. This makes it possible to sit down on the end of the seat while both legs are still firmly planted outside the shower stall. Then, from a safe seated position you can lift one leg at a time over the threshold, thereby eliminating the need to ‘step’ in and out. It also allows a person using a wheelchair to park the wheelchair beside the shower seat and independently (or with the assist of another person) slide sideways from the wheelchair seat over onto the shower seat.